CLEVELAND, Nov. 15, 2017 /PRNewswire/ -- Despite recent headlines, content marketing is alive and well in Australia. In new research just released from Content Marketing Institute (CMI), the report found more survey respondents are focusing on building audiences this year than last, which is a great sign, because putting audience first is key to advancing content marketing. 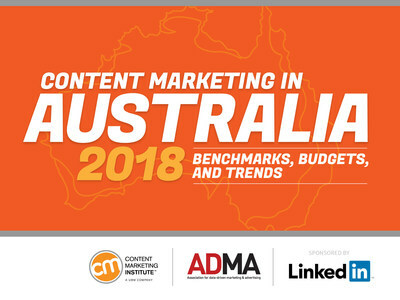 The new Content Marketing in Australia 2018: Benchmarks, Budgets, and Trends report from CMI was produced in partnership with the Association for Data-driven Marketing and Advertising (ADMA). The report is sponsored by LinkedIn Marketing Solutions. 85% of Australian respondents agree that their organization is focused on building an audience, versus 69% last year. That's a 23% year-over-year increase which is even higher than the 18% year-over-year increase reported by North America B2B content marketers. "The increased focus on building audiences is great news," explains Lisa Murton Beets, research director, Content Marketing Institute. "But now Australian content marketers need to take the next steps for even better results. For example, they need to focus on delivering content consistently and make sure that content is credible. And perhaps most importantly, they need to be committed to content marketing. Our research consistently shows that a stronger commitment, in general, results in greater overall content marketing success." "It's exciting to see that Australian marketers, including those who are just starting out with content marketing, understand the importance of using content to build relationships," says Jodie Sangster, CEO, ADMA. "There are no 'quick fixes' with content marketing. Marketers who commit to the approach, document their strategy, and create ongoing value for their audience will see long-term results." Watch this video, for a quick analysis of all of CMI's research. For research charts, key highlights, quotes and more, check out this folder. Content Marketing Institute is the leading global content marketing education and training organisation, teaching enterprise brands how to attract and retain customers through compelling, multichannel storytelling. CMI's Content Marketing World event, the largest content marketing-focused event, is held every September in Cleveland, Ohio, USA, and the Intelligent Content Conference event is held every spring. CMI publishes the bi-monthly magazine Chief Content Officer, and provides strategic consulting and content marketing research for some of the best-known brands in the world. Watch this video to learn more about CMI. Content Marketing Institute is organised by UBM plc. UBM is the largest pure-play B2B Events organiser in the world. Our 3,750+ people, based in more than 20 countries, serve more than 50 different sectors. Our deep knowledge and passion for these sectors allow us to create valuable experiences which enable our customers to succeed. Please visit www.ubm.com for the latest news and information about UBM. The Association for Data-driven Marketing and Advertising (ADMA) is the principal industry body for information-based marketing and advertising and is the largest marketing and advertising body in Australia with more than 600 member organisations. ADMA is the ultimate authority and go-to resource for creative and effective data-driven marketing across all channels and platforms, providing knowledge, advocacy, insight, and innovation to advance responsive and enlightened marketing.